Ceramic Arts (1957 – ca. 1977) has always struck me as one of the great lost studio and design potteries in Canada. Lost because most of its history has never been recorded, researched and/or seemingly celebrated or exhibited. 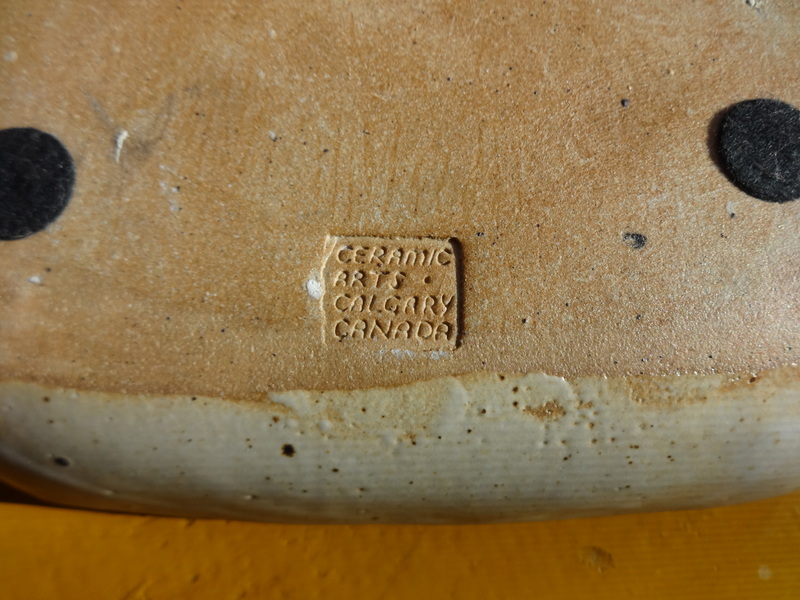 This lack of celebration of its role in Albertan and Canadian cultural history is probably due to many factors: the intensity of Canadian regionalism; the still pronounced curatorial emphasis on specific canons of pottery or ceramic production and/or influences; and what I would call — the tyranny of exclusion — in this case a marginalization of Canadian Mid-Century mass “craft production”. On this point one of the compelling aspects of Ceramic Arts — outside of the magnitude of its professional roster — was exactly its uncompromising orientation to commercial craft pottery. An example of this was its inspired marketing of studio designed ashtrays — in a form so widely distributed as to be almost symbolic of its modernist ambitions. We should not forget how ubiquitous this ceramic was through the 1950s, 60s and 70s and how popular was its allure as a decorative and utilitarian object. These ashtrays were produced in quantity and were often commissioned in connection with conferences and conventions in sites such as Banff, Alberta and eastern Canada. Shown below are some examples. One is likely by Luke or Vivian Lindoe – inset horse and rider pictograph. The second is likely by Walter Drohan or Rolf Ungstad – scored circle with straight line. The third example, a bowl with impressed flower and leaf is possibly not from Ceramic Arts. Stylistically, however, it captures much of the studio’s manner and may indicate some semi-formal association. All three exhibit the signature outward canted lip, strong central design, efficiency of production technique, and a contrasting of glaze and clay materials. It is unclear how Ceramic Arts worked individual practice into its business model or how the dynamics of design played out day-today, however, one can sense there were currents of creative constraint and latitude surrounding design and workmanship. Interestingly, the majority of production pieces seem not to have been potter and/or artist signed. Work by Vivian Lindoe may have been the exception. Her hand-lettered initials occur with some frequency. Another exception may have been on large tour-de-force pieces such this magnificent signed bowl or pancheon by John Porter. John A. Porter – for Ceramic Arts. 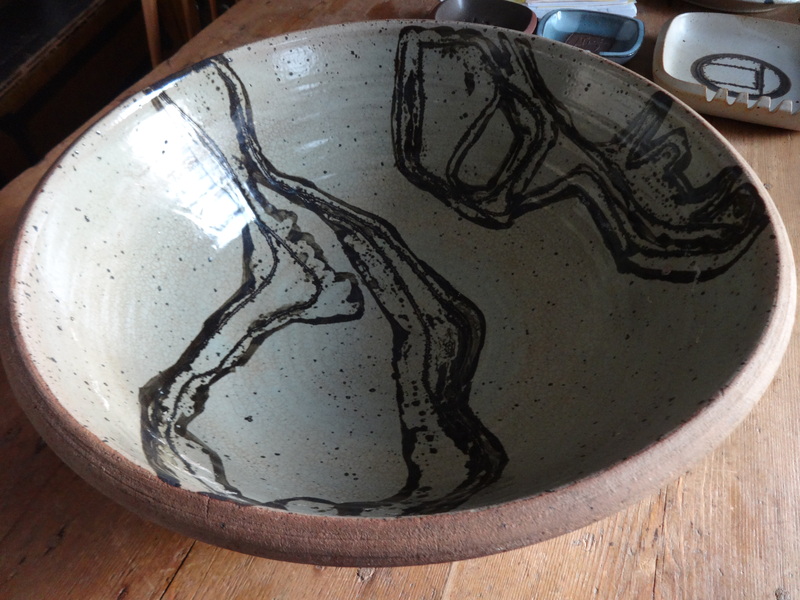 Signed stoneware bowl 17 1/2″ dia. x 7″ high. Domestic ware — mugs, bowls, plates — were also produced but I believe distribution was limited and generally quite regional. Here, the quality of design and workmanship appears to have been given a different standard of attention. There is less technical and artistic sophistication, which likely reflects a lack of coordinated design philosophy as well as a lower level of quality assurance or control within the line. Most of the work seems to have been solely studio stamped not potter identified. Finally, in writing this post I have preferred to use the term studio to refer to Ceramic Arts, not just “pottery” nor “business firm”. In fact Ceramic Arts is more precisely characterized as truly a Studio Pottery albeit in larger size. I would not characterize it as an Art Pottery — an entity with a vastly different face towards the world – nor as an Industrial or Commercial Pottery. Ceramic Arts shares features with each of them, but none, share its dedicated commitment and concern for hand crafting — a history that its alumni eloquently demonstrate. You might check Pinterest for marks but a very good check is to really see if the style, clay, form and glaze all “fit” in quality, technique and professionalism. Most pots don’t travel far. If you found it in AB it’s a fair chance it’s his. There are that many “Walters”. There is Walter Dexter — equally a professional – but I have only seen him use his last name with date. Nice find if its his! After emigrating to Canada,my husband Luke DeVries a master thrower on the wheel was delighted to find a job in his profession at Ceramic Arts. He loved the work but after a couple of years made the sacrifice for a better paying job for our growing family. After, In his spare time he would demonstrate in schools loving to interact with children. Luke DeVries June 25 -1940–April 16- 2015.